Saint Mary’s University and the Lebanese American University (LAU), have signed an agreement that will open doors to more collaboration between the two institutions. The agreement allows for a variety of new opportunities including academic and professional exchange, joint research and short-term academic programs. LAU President Dr. Joseph G. Jabbra welcomed Saint Mary’s President and Vice-Chancellor, Dr. Robert Summerby-Murray, to the Jamil Iskandar Conference Room at LAU’s Byblos campus on October 9, 2018, to sign the agreement. President Jabbra is known to many on campus from his time spent as both an active member of the political science department and as the Vice President, Academic and Research from 1980 to 1990. In April 2017, President Jabbra received a Doctor of Civil Law, honoris causa, from Saint Mary’s. Saint Mary’s President Dr. Robert Summerby-Murray and LAU President Dr Joseph G. Jabbra sign the collaboration agreement between the two universities. Saint Mary’s University has a well-established commitment to cultural diversity and encourages and supports the development of a global perspective. This new collaboration supports Saint Mary’s commitment to international and intercultural education and the global connectivity of the university and the university’s research partnerships. 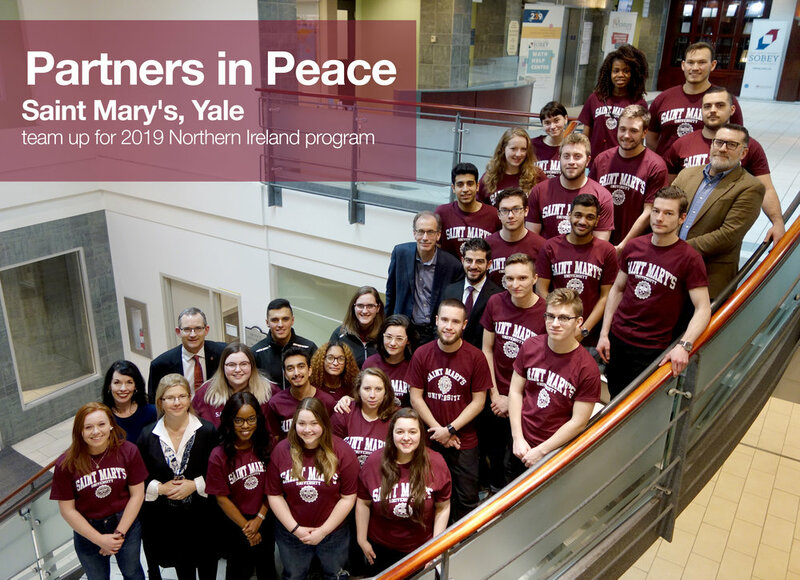 Saint Mary’s is recognized as a Canadian leader in these areas with extensive international outreach and collaboration by way of institutional linkages with universities around the world. This agreement with LAU marks another opportunity for students, faculty and staff to benefit from global perspectives and partnerships. At the signing, Dr. Summerby-Murray emphasized the importance of the collaboration and the strong foundation that is already in place between both institutions and countries. The end of the event was marked by the exchange of gifts between the two presidents. The partnership is expected to begin shortly, with a representative of LAU expected to arrive on campus later this month. This weekend, the flags in front of the McNally Building will fly at half-staff in solidarity and in remembrance of the victims of last week’s shooting tragedy in Fredericton.